With so many of my friends loving pandan, we really wanted to make a pandan-flavoured ice for the Ice Cream Party, but I wasn't quite sure how to go about it. At first, I thought I could just make a regular custard-based vanilla ice cream, substituting pandan leaves and essence for the vanilla pod, but thought it might be a little flat. (And adding an essence to a plain base would just feel like cheating!) 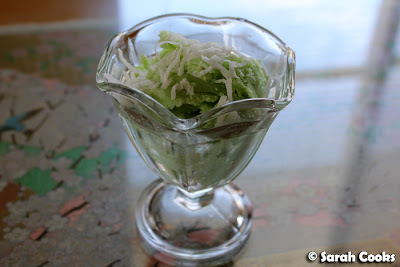 But when I came across David Lebovitz' recipe for toasted coconut sherbet in Ready For Dessert in my pre-party research, I realised that the tropical, coconutty base would make the perfect partner for my favourite Malaysian flavour. Sherbet, I've learned, is a milk-based frozen dessert, often lightened with whipped egg whites. Unlike ice cream, there are no egg yolks, nor cream, so it's not quite as rich. I suppose you could also think of it as sorbet with milk. I've typed my adapted recipe in full below, but let me take you through some of the major steps first. (If you want the original recipe, or a whole chapter of fab ice cream recipes, as well you should, check out Ready for Dessert). The first step is to infuse fresh pandan leaves and toasted coconut in sugar and milk. I toasted the coconut in the oven (keep an eye on it so it doesn't burn! ), and it smelled so lovely! I made a huge mistake though - enticed by the coconutty aroma, I opened the oven and took in a big whiff, only to choke and have a terrible burning sensation in my eyes! The brand of coconut I'd bought contained a sulfur-based preservative. I'm not sensitive to sulfur, but it certainly wasn't the best idea to inhale those fumes. Whoops! 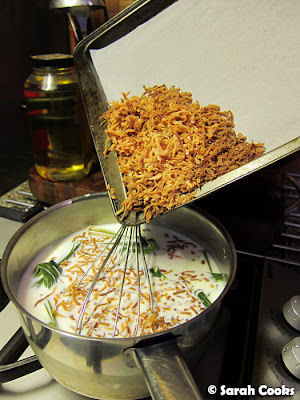 Once the milk has absorbed the flavours of the pandan and coconut (about an hour), you strain them out and discard them. The flavoured milk is the base of your sherbet. 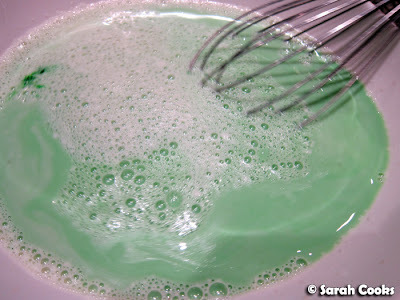 For me, pandan just isn't pandan without a lurid green colour, so I added a small amount of pandan essence to the flavoured milk. Finally, you fold through some whipped egg whites - and it's ready to churn! I was so, so pleased with how this turned out. The slightly icy sherbet was wonderfully refreshing, with both the pandan and coconut flavours sending me straight back to sunny afternoons in Penang. A friend of mine described it as having the same flavour as kuih kapit (Malaysian love letter biscuits), but with its light, icy texture, I felt it was closer to cendol or ais kachang - perfect for these hot, humid days we've been having! Preheat the oven to 180C. Spread the shredded coconut in a thin layer on a baking tray. Place in the oven and let toast for 5-10 minutes, stirring occasionally, until the coconut is evenly browned and smells gorgeously coconutty. Set aside. 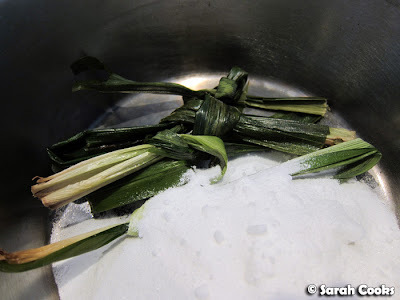 Tie each of the pandan leaves into a knot. Place the milk, sugar and pandan knots into a saucepan, and heat until almost boiling. Take off the heat, add in the toasted coconut and stir to combine. Place a lid on the pot, and allow to steep for an hour. Strain the liquid into a large bowl, squeezing the coconut to extract as much liquid as possible. Discard the coconut and pandan leaves. Stir in the pandan essence. Cool the liquid over an ice-bath until chilled through. Just before churning, whisk the egg whites with the salt until soft peaks form. Fold the egg whites through the chilled milk mixture. Freeze in an ice cream machine according to the manufacturer's instructions. 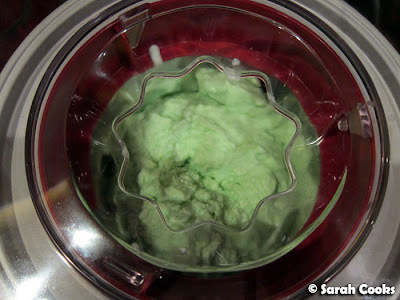 Sarah received the Cuisinart 2 Lt Frozen Yoghurt, Sorbet & Ice Cream Maker courtesy of Kitchenware Direct.